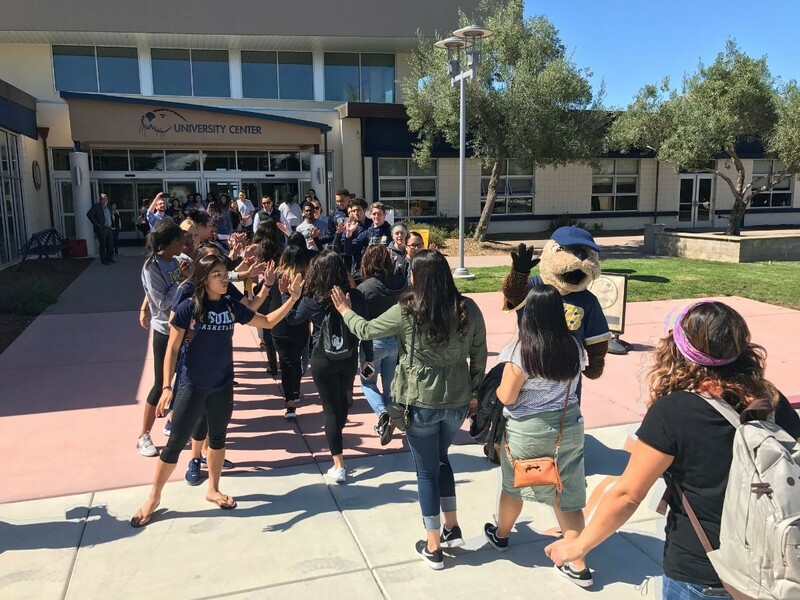 SEASIDE, Calif., September 22, 2017 – Students enrolled in the CSUMB-Hartnell South Monterey County Teacher Pathway Program* visited CSUMB for the first time and were welcomed by the men's and women's basketball teams as well Monte Rey, our sea otter mascot. 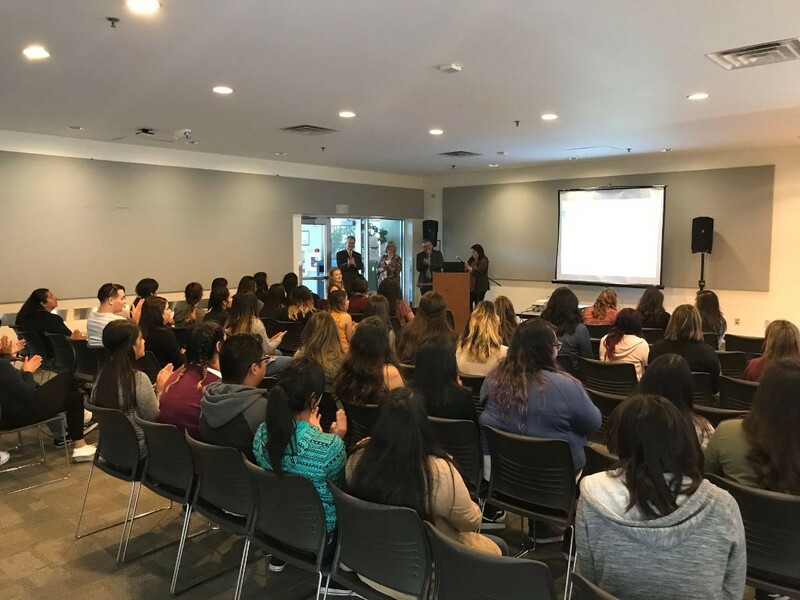 The visiting students, all members of the second cohort of the new collaborative program with Hartnell College, are currently taking classes at the Hartnell College King City Education Center but have access to resources and support at Hartnell and CSUMB. To bring our curriculum down to their campus is very exciting for us. "We're tapping into local talent, but also every single one of these teachers then becomes role models for students who are currently in schools," explained Dr. Jose Luis Alvarado, Dean of the College of Education at CSUMB. "It's allows them to see and say, 'Hey, there's my aunt,' 'There's my cousin who's teaching now.' And those young ones they're teaching will then aspire to go to college and we will begin to see a transformation of the entire community in South Monterey County." Resources at Hartnell and CSUMB include tutoring, cohort enrichment and pre-professional workshops, priority registration, stipends, targeted academic advising and mentorship. The basketball teams and Monte Rey greet our future teachers at the University Center. 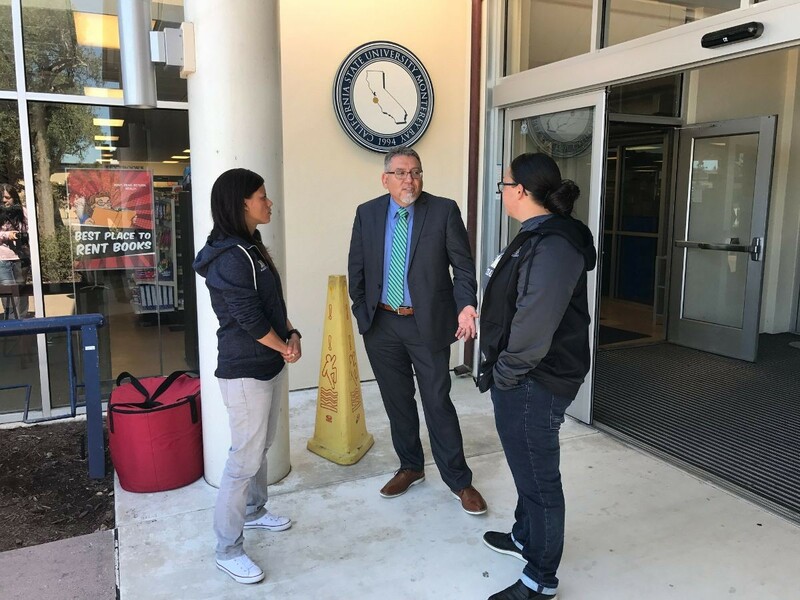 Dr. Jose Luis Alvarado, Dean of the College of Education, chats with Kerri Nakamoto (r), head women's basketball coach. President Eduardo M. Ochoa and Provost Bonnie Irwin welcome the cohort of students from King City. We will begin to see a transformation of the entire community in South Monterey County. Hartnell College and CSUMB have built the teacher pathway program with an eye towards sustainability; ensuring this project continues to prepare fully qualified elementary and special education teachers well into the future. Gallardo credits local support. "Thanks to the generous support of the Claire Giannini fund and the Salinas Mariachi Festival community fund raiser, the Teacher Pathway Program is able to collaboratively design and implement an academic pathway to credential that offers students resources and support such as tutoring, mentorship, advising and pre-professional development opportunities. * This program is pending CSU Chancellor's Office and WSCUC approval.